One of the most beautiful parts of sharing my Pregnancy Yoga and Birth Preparation classes is working with mums over the months of their pregnancy, holding a space for them to share their thoughts, hopes and fears surrounding labour, and then sharing practices, spaces to talk and information which helps them to start to feel excited, positive, calm and empowered about their approaching labour and confident in their ability to cope well with it. a community of friendship with like minded mums to share feelings, hopes and experiences with during pregnancy and strong friendships which continue to provide connection and support for mums and little friends for babies to grow and play together. Connection with our breathing is the foundation of yoga practice. In pregnancy the practices help us to recognise, and then learn to let go of tension and anxiety in body and mind, to signal to our nervous system that all is well and we do not need high levels of adrenaline and stress hormones (the stress response can inhibit labour, and learning to breath and relax deeply helps keep stress hormones at bay and labour hormones high). Our breath is what gets us through labour…. we learn to breathe deeper than the intensity of what we are feeling, to breathe through the contractions and to let go of all of this with our long, slow powerful exhale. We learn how to use sound in a really supportive way to connect with our inner strength and get through the intensity of powerful contractions and breathing our baby out. 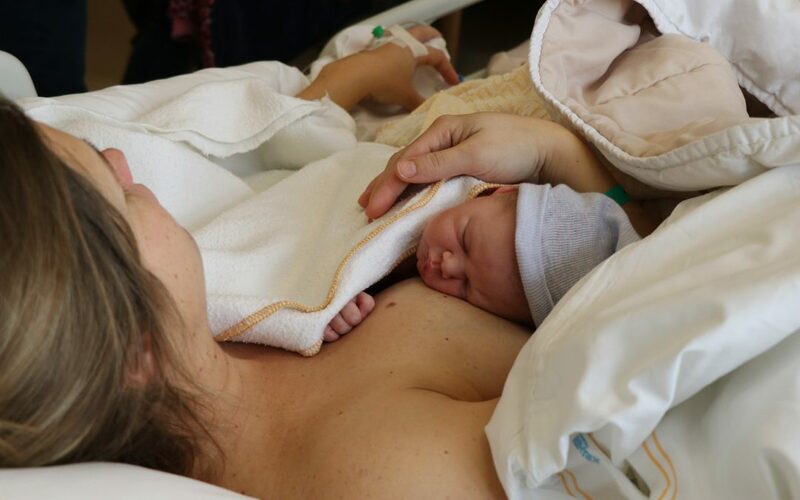 For Caesarean Birth our breath becomes our bridge of connection with our baby, helping us feel calm, keep relaxed and connected, helping to stabilise our blood pressure and enjoy the experience of meeting our baby skin to skin. You can listen to many free Pregnancy Yoga breathing practices here. Yoga postures offer support, strength and stability to our bodies during pregnancy, helping to ease and prevent back pain, stabilise pelvic pain and release tension, aches and pains. Each week we look at the connection between the positions of our body and how these influence the position of our baby. Regular practice of many all four type kneeling postures helps maintain good posture and keep our backs healthy and this regular practice means we are automatically comfortable with these postures and movements to rely on during labour. Rocking, swaying, circling leaning all four postures are the postures we would naturally adapt in labour if we haven’t been conditioned to see labour as a painful process where we are the patient and must lie on our backs….Practicing these postures regularly means we release our inhibitions and are able to use the postures freely which help us cope well with labour, understanding why this helps our baby into the most favourable position for his birth. Regular weekly practice breaks down cultural images of what labour looks like… how it is portrayed in media as disempowering and painful, and helps us create new images of what birth can be like, and how we would like to move and behave in our own baby’s birth. It gives us the confidence to do what we feel is right for us at the time, to try different things and to ask for what we feel we need. We approach labour with confidence, knowledge and empowerment of what we can do to work with ourselves and the process. Deep relaxation…. ahhh… everyone’s favourite part of the class, especially baby’s! During pregnancy our baby’s share our hormonal experiences, so building in periods of deep relaxation brings a welcome time of restoration and deep peaceful connection between ourselves and our babies, a welcome change from the rushing, stress and adrenaline fuelled busyness which most of us deal with each day. Stress and tension are usually backed up with the stress response from our nervous system, a response which we know inhibits labour hormones. Also tension in our body means we resist our contractions, fight against them and experience them as more painful. Regular practice of deep relaxation is a cornerstone of yoga and the foundation of our overall health; using relaxation during labour helps us dissolve tension from our body, let go of stress hormones and gives us the mindset that we are able to cope, move, breathe and get through each contraction, for the relaxation offers us a place of peace and respite to return to. So often I hear from mums how the Peace Release practice and Pregnancy Relaxation breathing became their anchor during labour, helping them let go of the intensity and return to a place of softness, peace and connection, ready to breathe through the next wave of contractions. Deep Relaxation is a gift we can and should give to ourselves and our babies as often as we can, both during pregnancy and beyond, it aides our inner connection, healing and replenishment on all levels of our being and is an absolute must for our post natal healing and coping with the intense years of early mothering. You can listen to beautiful Pregnancy Yoga relaxations here; make them part of your day, listen to them often and feel the benefits for yourself. I also offer One to One Birth Preparation Sessions where mums and their birth partners attend together in a private session. These sessions are fun, and offer a safe, supportive space to explore hopes, feelings and fears surrounding labour, and give birth partners the time to learn the many ways they can provide excellent, efficient hands on practical and emotional support. If you are interested in attending a taster session of Pregnancy Yoga and would like to find out more, book your place or book a Women’s Wellness or Post Natal One to One session, I would love to hear from you. You are welcome to contact me via our facebook page Beautiful Beginnings Yoga and Pregnancy Yoga email milestonesofmotherhood or via 07906 188 345. Nurture yourself and give yourself the gift of time to enjoy moments of your pregnancy, the beautiful curve of your bump, the amazing movements of baby, and the dreams of meeting baby face to face.